Click to enlarge view ! 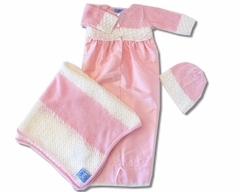 Beautiful Knit top - with pale pink silk gown - dainty lace and ribib tie bottom - embellishes this* Heirloom Takes Me Home* Layette. x-s = new born , s = 3 months. Matching Knit Hat - and Blanket available.